In lesson 8, you have understood different types of data and learned how to write code involving the numeric and non-numeric data. In this lesson, you shall learn how to store the data and how to declare them. 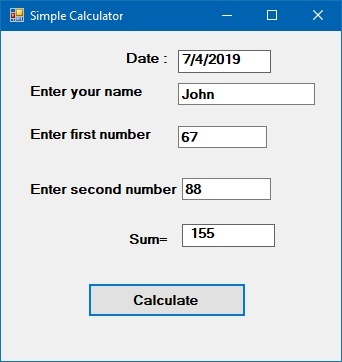 In Visual Basic 2019, data can be stored as variables or constants. Variables are like mailboxes in the post office. The content of the variable changes every now and then, just like the mailboxes. In Visual Basic 2019, variables are the specific areas allocated by the computer memory to store data. In Visual Basic 2019, you need to declare the variables before you can use them. To declare a variable, you assign a name to the variable and state its data type. If you fail to do so, the program will run into an error. Variables are usually declared in the general section of the code windows using the Dim statement. Dim YourName As String = " George"
In this example, we create a simple calculator where the user enter his name, two numbers and click the Calculate button to compute the addition of the two numbers. It also display the date. There are three data types here, String, Integer and Date. We also use the Format function to display the current date of computation. 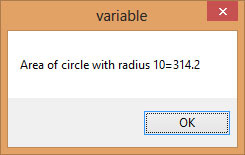 Running the program and clicking on the Calculate button produces the following output as shown in Figure 9.2. The above keywords indicate the scope of the declaration. Private declares a local variable or a variable that is local to a procedure or module. However, Private is rarely used, we normally use Dim to declare a local variable. The Static keyword declares a variable that is being used multiple times, even after a procedure has been terminated. Most variables created inside a procedure are discarded by Visual Basic when the procedure is terminated. Static keyword preserves the value of a variable even after the procedure is terminated. Public is the keyword that declares a global variable, which means it can be used by all the procedures and modules of the whole VB2019 program.